What’s on your innovation horizon? Ping An is China’s second-largest life and property & casualty insurer. In the next sixty days, they plan to open 1,000 clinics, with none having on-site staff. This is just two months from the debut of their staffless medical clinic and pharmacy at the Wuzhen World Internet Conference which took place earlier this month. Opening an average of over thirty points of presence a day for two months sounds crazily ambitious, especially for from a payer organization. But there’s little about Ping An which isn’t that way. The three-year old company has $700 billion in revenue. and their app currently serves 50 million Chinese patients a month. So their ability to move fast is well-established. Patients enter an “Independent Advisory Room” which is about the size of a phone booth. They receive a virtual consultation starting with an assessment by Ping An’s Artificial Intelligence enabled Doctor software. Information gathered from the assessment helps initiate a telemedicine session with the right human physician who makes the diagnosis and interacts with the patient. The Advisory room has an attached Smart Medicine Cabinet vending machine, which stocks over 100 medications on site. 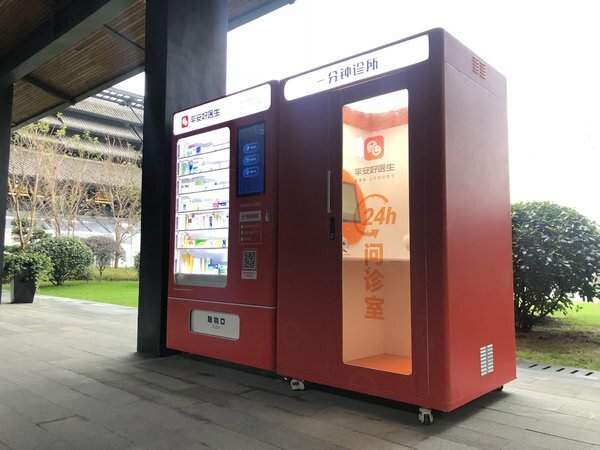 If other medications are needed, they can be purchased through the Ping An app and delivered to patients in the areas served by these facilities in just an hour. That’s a pretty huge change from the doctor office visit that most clinicians were trained to perform in medical school, which makes Ping An’s experience as an app is invaluable. Having concluded 300 million patient visits by app, they have data resources that provide the company’s 1,000 doctor team an empirical basis for providing better advice remotely. Connecting data makes Ping An’s solution downright intriguing. You see, provider organizations tend to own a lots of the patient relationship, but payer organizations have an unparalleled view of clinical activity and cost. Ping An’s ability to join millions of clinical treatment episodes to their comprehensive view of clinical activity presents an opportunity for improvement and discovery. Naturally, every culture decides how medicine may be practiced in it. This kind of innovation opens up the kind of questions that may be seen differently in different cultural contexts. Consider, “optimization” which sounds benign and tech-led, but it could easily stray in to ad hoc human research. Cultures take differing views on the kinds patient data payers should be allowed to keep or using to restrict information or access to treatment. There may be a point when anonymized data should either be forgotten or opened-up for public use. It some ways, this is taking on one of the most complex businesses cases first. A massive network of unstaffed doctor booths will just raise more questions that other endeavors. So, since this is happening, it seems like a smart move for more traditional businesses consider how they could change. 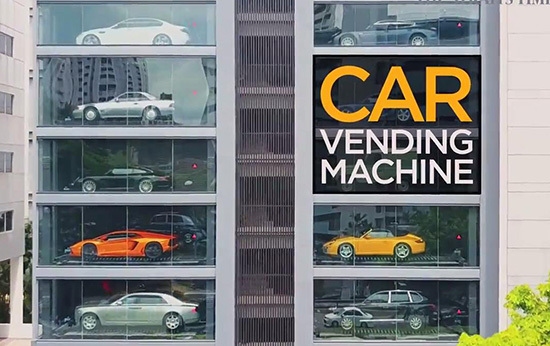 This showroom in Jalan Kilang, in Bukit Merah, Malaysia is hailed as the world’s largest “vending machine” for cars. We’ve pretty much accepted shifting humans out of selling access to highways, mass transit systems and ski resorts with the combination of smart objects and system automation. How might we mix remix experiences in senior care, fitness clubs, or in retail settings where something like Amazon Go could facilitate useful interactions mixing human interaction and artificial intelligence? How about selling real estate, or talking about why an investment plan is suitable? As you think about the ways customer experience can change in the new year, this combination of remote interaction, automated systems and machine learning can get teams thinking on ways to increase the convenience and accessibility of their services to wider audiences. To some degree, swapping the phrase “artificial intelligence” for automation and machine learning makes these changes a more approachable. The leaders I work with healthcare are already using such approaches to improve diagnosis and to mix machine and human interaction in new ways to richer provider and patient experiences. I’ll write more about this in the new year. But for now, when you think of healthcare innovation (for good or ill) imagine it on a scale of 50 million visits a month to facilities where no doctor is present. That’s Ping An’s plan to remake healthcare, what’s yours?